The Blue Ocean Strategy focused on the Value Curve concept, using which organisations could either reduce or increase those features of the product that provide greater value to customers, compared to the industry standards and competitors. It’s a wonderful way to define the value Strategy of an organisation, focusing on building a unique proposition in the market. The value life cycle theory builds over it, by highlighting the organisation’s need to renew value for its customers by maintaining or even improving utility derived from it. It is based on the premise that value from the customers’ standpoint is a Lifecycle of the Need that continuously transforms itself over a period. Either due to technological changes, changes in consumer behaviour, change in the macroeconomic scenarios or new competitors entering the market, needs get reshaped as a result the utility derived from the product or service diminishes over time. The value Journey Roadmap is a guiding force behind making the Digital Transition successful through a sustained effort to drive value creation, value re-design, and value sustenance. Organisations have to stop thinking about features driven product roadmaps and start concentrating on value-Driven product Roadmaps and Lifecycles, where it is more about leading the value Journey Maps for customers. The immediate impact of that will be moving away from the numerous product features and concentrating on one’s which add value and bring utility to customers. Value Creation is the first stage of the value life cycle and focused on creating a utility for first-time users. This is the initial stage and the very first engagement between the customer and the organisation and hence, its impact and magnitude for customers are highly dependent on the customer experience generated and the utility derived from the product. Value sustenance is a regular phenomenon of upgrading or updating the product on an ongoing basis to ensure its utility to its customer stays relevant to changing trends. Small incremental developments similar to Over the Air Updates pushed in Android, iOS and Microsoft Operating system to ensure additional features are added and Bugs are fixed within a product or service, which ensures customers are always up to date with the value proposition provided by the product. 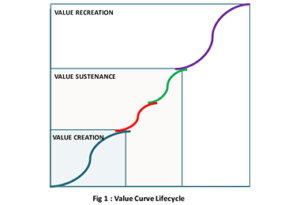 Value Re-design is more oriented toward re-discovering new value proposition within the same product or service and comes into effect when value derived out of the product goes down the S-curve leading to a fall in utility, thereby leading to the threat of losing the customer. The Law of Diminishing Marginal Utility best defines this phenomenon, where the value is derived from the utility, a product or service extends to its customer, however, as we start consuming the product, the utility starts diminishing, thereby leading to diminishing value derived from the same product. This ensures that customer looks at the product or service from an entirely different perspective in terms of fulfilling their needs. Amazon’s aspirations to be world’s most customer-centric company are driven by value life-cycle approach. When it started its venture back in 1995, books were the cornerstone of e-commerce giant portfolio and focus was on providing the customer with the convenience of buying books sitting at their desk. Initial availability of books online was a significant value creation for its customers, as it cut down the cost and time of purchasing a book from the bookstore. Beyond this, the comfort to accessing and purchasing the books at your own behest was a tremendous shift in terms of the user experience. Utility derived, was primarily in terms of Reduction of Time, Great improvement in convenience and access to a huge library of books to look at. However, with e-commerce at its peak and other similar ventures getting into the market, Consumer utility from service diminished as they got used to the way these services were delivered. That’s when, in the year 1997, Amazon in order to sustain the value of its services, introduced the One Click Shopping to enhance customer experience and engagement, which nearly tripled the value of Amazon stock. The value derived from this feature was a further enhancement in the ease of using the platform to ensure that the customer’s coming to the site do not get confused in the process of purchase due to multiple steps involved. This meant that Amazon had moved up a level for value sustenance thereby maintaining the utility of its service. Additional features like recommendations etc. were added in due of time to ensure value sustenance. The Launch of Kindle in November 2007, was again a significant jump in value and led to transformation across consumption of the books. The world of reading changed forever for when it targeted the same segment of customers to buy a hardware device, which can not only enable the standard feature of a typical Amazon site but beyond that, will also enable the customer to read as many books without having a physical book with themselves. Jeff Bezos realised the fact that there were a few technologies, which were converging, and that they could combine with the right recipe and hoped of making something transformative in the world of reading. This meant Value Re-creation from the perspective of maintaining one’s own library of books online with an anywhere and anytime access to content, thereby building an additional layer of utility around further reduction in time from purchase to delivery. The depiction below in Fig. 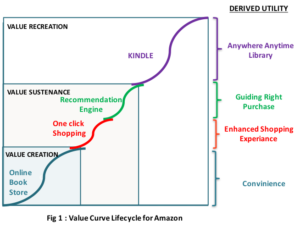 1 clearly articulates the Value Curve Lifecycle for Amazon Books. Hence, value derivation is primarily a factor of organisational maturity in understanding customer insights and building an experiential journey around it to generate utility. For this, organisations have to sense, feel and own the pain of their customers and internally align themselves to drive the experience that will make their customer’s feel the difference. However, it’s not as easy as it is said. The culture created within the organisation, the people hired and the way they are treated, the capabilities created in the field to interface with the external world and your customers are all contributing to not only building experiences but also building perceptions in the mind of your customers. Thinking about building a great customer experience, without building your internal capability will lead to increased pressures within the organisation, which it cannot handle, thereby leading to internal chaos and dissatisfaction and ultimately affecting the customer experience. Given the importance that organisations, specifically, startups are giving to customer experience, there is a rise of Customer Centricity in great proportions. Amazon’s customer-centric approach for running its operations is a terrific example of this. For fulfilling this, Amazon has built their organisational culture, people, and processes in line with this objective. They are known to have a rigorous recruitment process where candidates go through an eight-stage interview and evaluation process based on compatibility, focus, and attitude towards Customer. Well, it’s just not about one approach anyway. It’s about how well this objective gets imbibed into the day to day operations of any organisation which will enable the customer to see a uniform experience across various customer touch points.